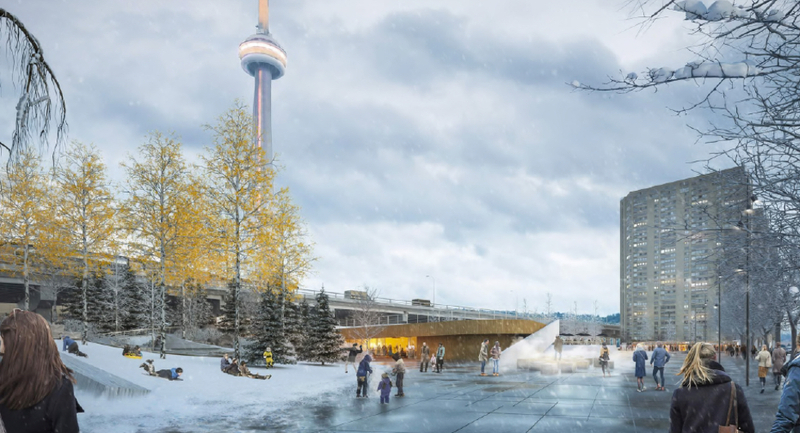 Earlier this year, a number of local and international architects were invited to submit designs for Toronto’s two new waterfront parks. 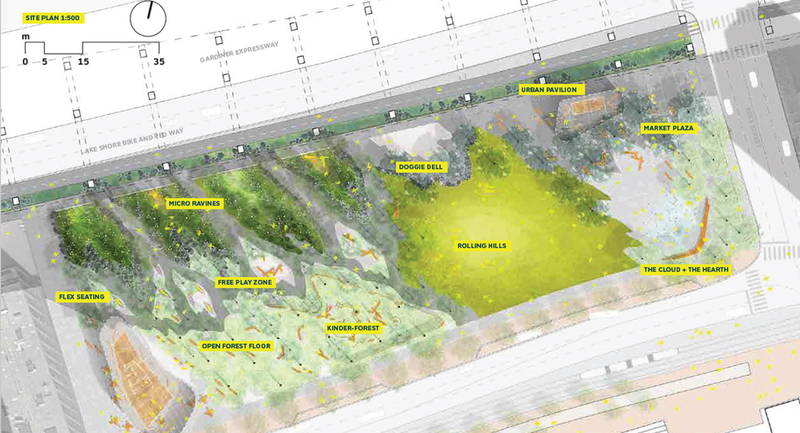 From toboggan hills to modular green spaces to love-themed reflecting pools, here’s what they proposed. 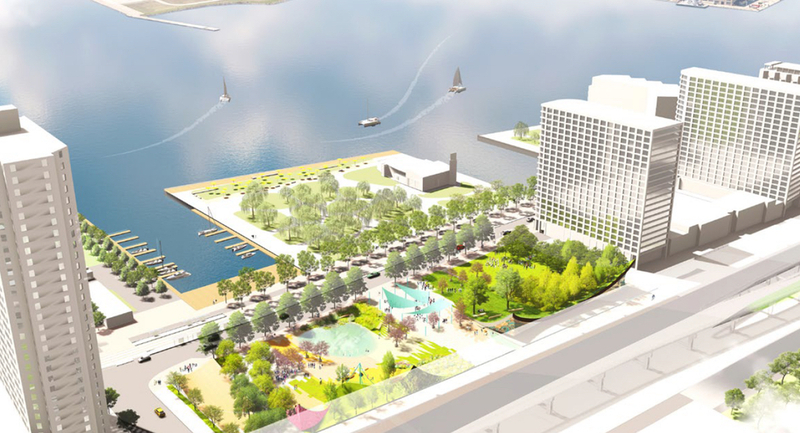 In January, Toronto announced that it would be holding a design competition to imagine two new waterfront parks. Located 650 metres apart on Rees (below, left) and York streets – an area frequented by tourists, office workers and the nearby condo-dwelling community – both parks promise to add a significant dose of green to an area that, despite its industrial origins, is developing into a multimodal corridor. Even if there have been growing pains. The winners of the competition will be announced before the end of the year. But for now, we have the shortlisted finalists. 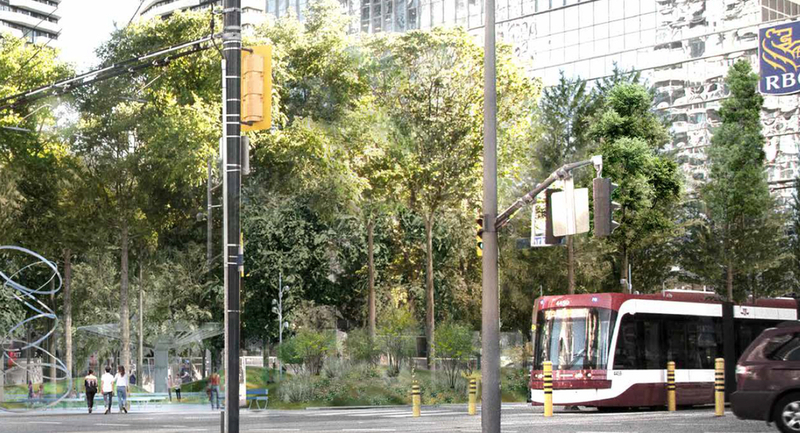 Here’s a closer look at how a number of interdisciplinary teams are vying to create transform two parcels of land into green gateways – which, after being coordinated by Waterfront Toronto and the city, will eventually be owned by Toronto’s department of Parks, Forestry and Recreation. 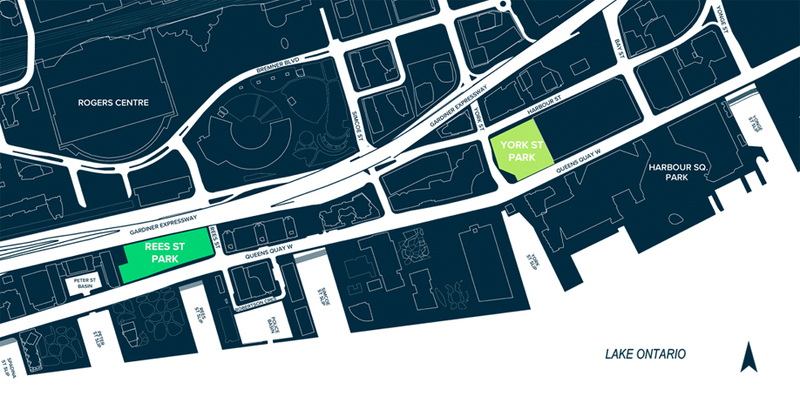 A parking lot currently occupies the space between the Rogers Centre arena and Queen’s Quay’s bustling boardwalk – and that’s where a future 0.95-hectare park will sit. 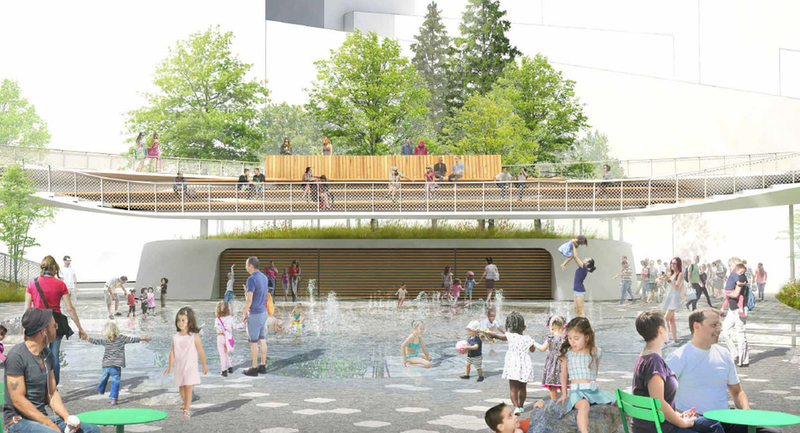 With a $10 million budget, the city called for an all-ages play area, a prominent water feature, an architectural pavilion, lawn space and a connection to the city at large. Here are the five finalists. Key features: Down North, say its designers, is inspired by the hinterland, or the forested area at a lake’s edge. The firm is proposing a mixed conifer forest with more than a hundred 30-foot-tall trees, which it calls “critical new infrastructure” to combat pollution, stormwater flooding and the heat island effect that is certain to amplify with climate change. 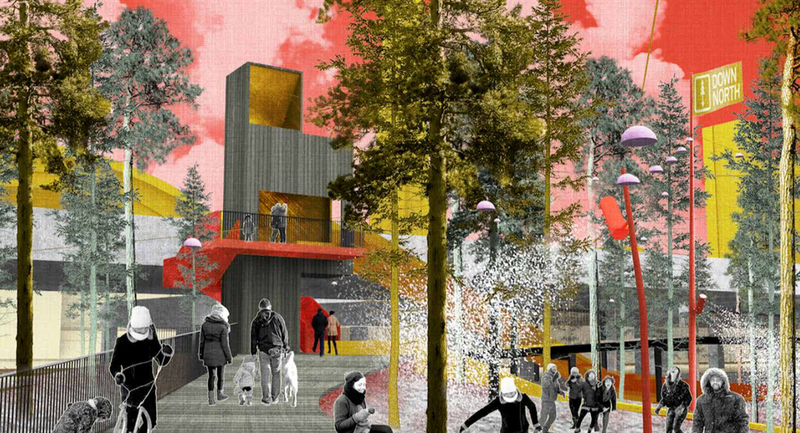 At the same time, it’s a winter-focused park, aimed at animating the city during the colder months. Down North will be segmented into three broad swaths: The Woods, which features a toboggan tower, elevated points overlooking the lake, and an all-season water feature that doubles as a snow-making machine; Lakeshore Sliver, defined by cliff-like gabion walls filled with demolished-building rubble, a stormwater-collecting bioswale, seating and bicycle parking; and the Switch Side, a “malleable urban park” with basketball courts, lawns, fire pits and kiosks. 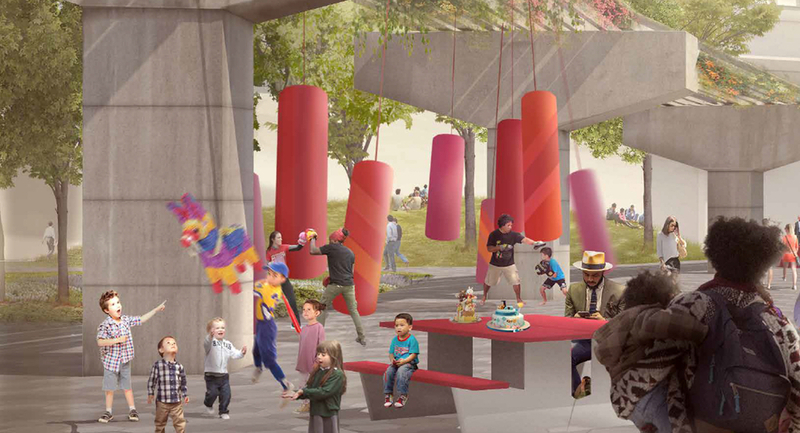 Four shipping containers will populate the park, providing flexible shelter – which, Public City suggests, could even house lunchtime DJs. Key features: The Rees Ridge proposal, at its most general, is a bluff – or something that’s simultaneously a landmark and a lookout. That’s intentional: it’s an interpretation of Toronto’s waterside Scarborough Bluffs, and it aims to promote biodiversity, host a wide range of activities and provide pathways to the lake. The architects envisioned Rees Ridge as a “room within the city.” Built on a gradient, with the corners of the park lifting, the concept is distinctly three-dimensional. 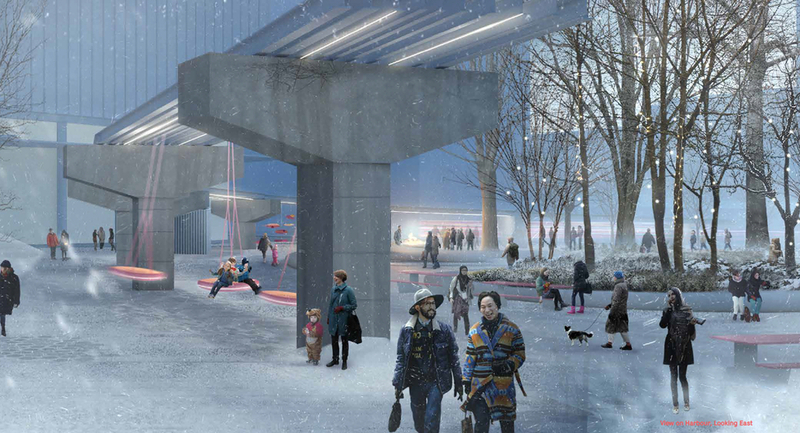 Its slope provides a buffer from the noise and pollution of the Gardiner, while also offering a climbers’ plaza, a canopy-turned-bandshell, outdoor market areas and a striking cantilevered pavilion. An interactive waterfall, running from the ridge’s crest to its floor, is wHy and Brook McIlroy’s proposed water feature, while the undulating topography provides opportunity for exercise. From its peak, Rees Ride offers pristine views of the lake; from its valley, a postcard view of the CN Tower. Bordering the highway with four micro-ravines, a doggie play area and a marketplace, the park connects to the Queen’s Quay boardwalk through the Open Lawn, a half-acre meadow-like clearing. As its name suggests, a wide range of trees will be featured: clonal forming species will define the Micro-Ravines, deciduous trees will populate the Forest Floor and evergreen and deciduous conifers will fill out the Urban Grove. 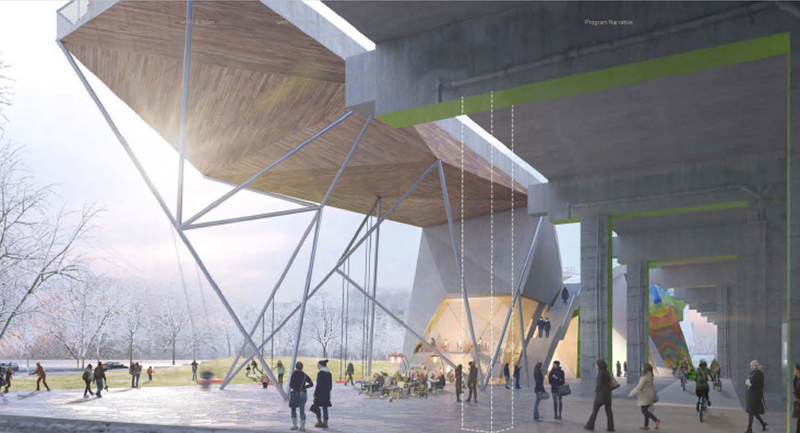 A ravine walk helps visitors traverse the park, which is bordered by a pavilion – with washrooms, storage and more – and The Cloud, which will mist the park with water droplets during the summer. Key features: The Nest proclaims itself as “a backyard for the people,” or a communal gathering zone perched on the city’s front yard – Lake Ontario, natch. 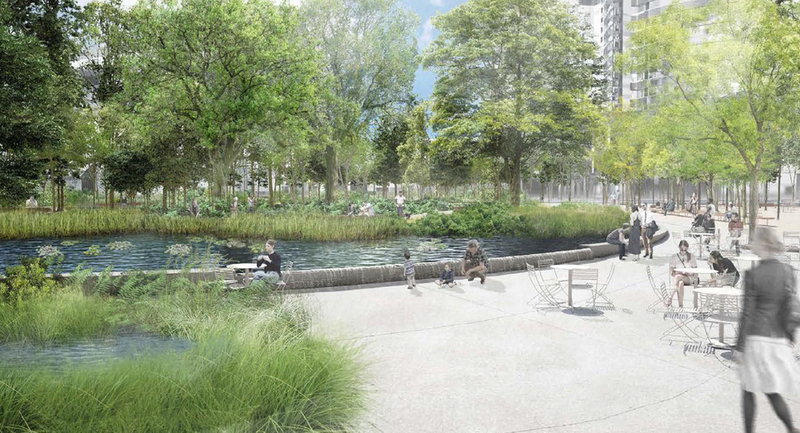 With a porous edge connecting to HTC Park, which provides direct access to the water, The Nest includes Alvar gardens, birdhouses (above), a BBQ region and a stormwater shaft. Tree Walk and a Hammock Grove provide opportunities to linger in the park. Though less bold than its counterparts, Snøhetta and PMA’s proposal is highly sensitive to its context – and will be purpose-built to withstand an evolving city. Meant to “stitch” together the surrounding neighbourhoods, The Nest takes material cues from nearby projects – such as Queen’s Quay’s brick paths and DTAH’s undulating Simcoe Wave Deck, both collaborations with the Dutch firm West8 – and references them in the park. Key features: Rees Landing invites visitors to edit the landscape. Through a series of modular surfaces, the proposal offers strips of land that can be easily curled up, pushed down, sheltered or exposed. The big idea, here, is that it can adapt to an ever-changing environment – or towards the needs of the surrounding community. 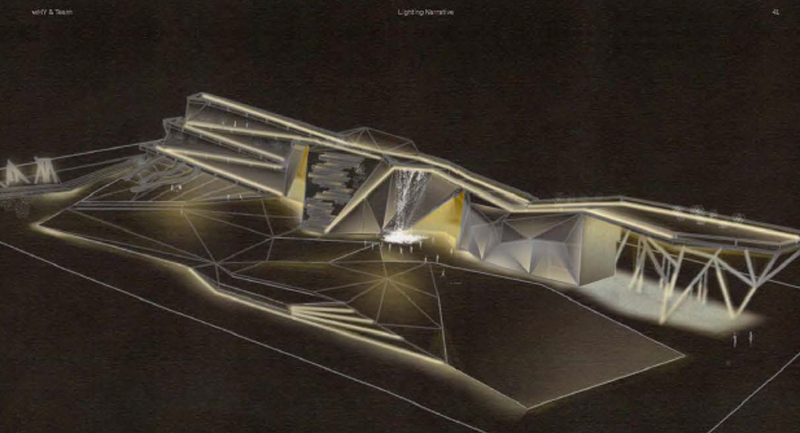 The result is an adaptive landscape, with topographies formed to accommodate a number of pavilions, art walls, water features, forests, pools and more. 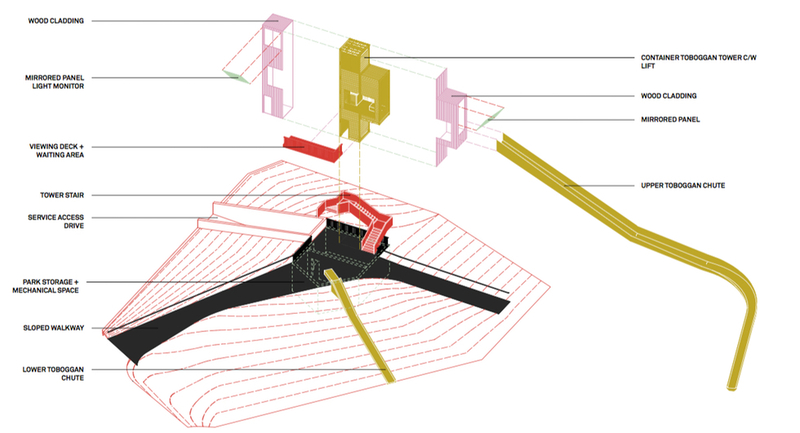 The layout suggested by Stoss and DTAH, however, includes a double peel raising to meet the Gardiner, a recessed Market Zone with integrated retail tents, an gently sloped pavilion that doubles as a lookout, flexible play areas and a pool. 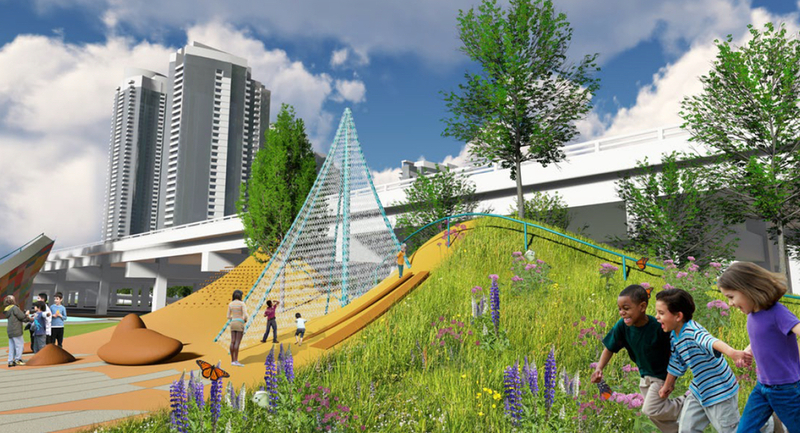 With $7 million earmarked for redevelopment, the York Street Park will replace a former off ramp that once connected to the Gardiner Expressway. With closer proximity to high-density office buildings than Rees Park, York’s design brief calls for a leafy respite from the bustle, filled with event spaces and lunch- (and break-) time activity. 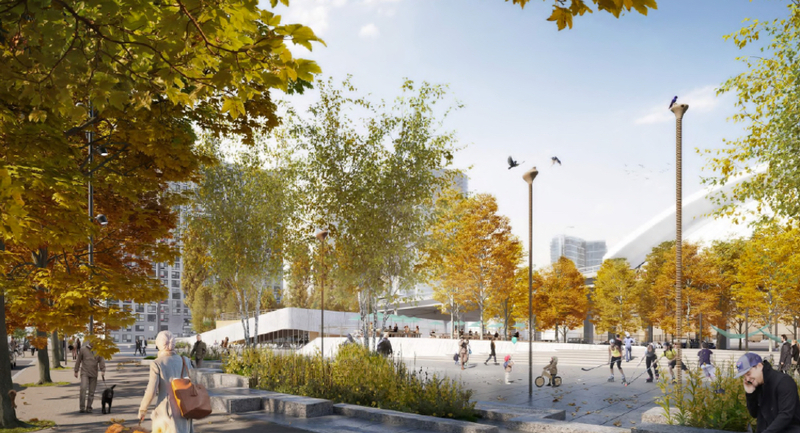 The 0.8-hectare, teardrop-shaped site will contain water features, amenities for dogs and, in many cases, a creative repurposing of the concrete bents that supported the Gardiner’s former off ramp. Key features: Parc Vert envisions itself as an “introvert park,” a place for refuge from the din of the city. 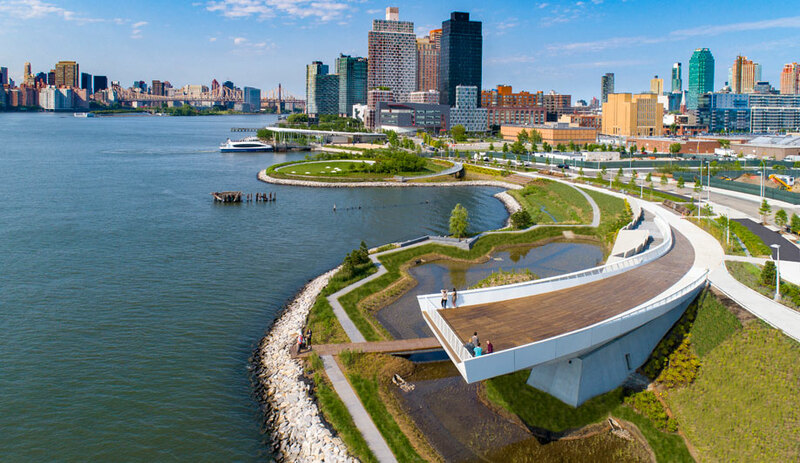 A canopy forms over pedestrians who wander through the Forest Floor and the Urban Forest, but the standout feature of this proposal is the Tree Walk, a gently inclined ramp that curls around the circumference of the park, providing views of both city and lake. It’s a subtle reference to the highway off-ramp it replaces. 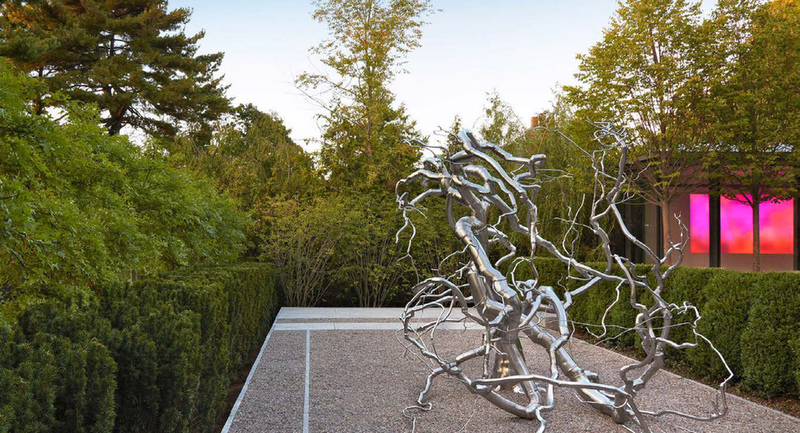 The park’s three layers – Forest Floor, Urban Forest and Tree Walk – were designed to continually unfold to visitors, providing surprise at every turn. Though its outer rings provide shade and introspection, it also circles around an area called the Clearing, filled with an amphitheatre, customizable furniture arrangements and temporary markets. 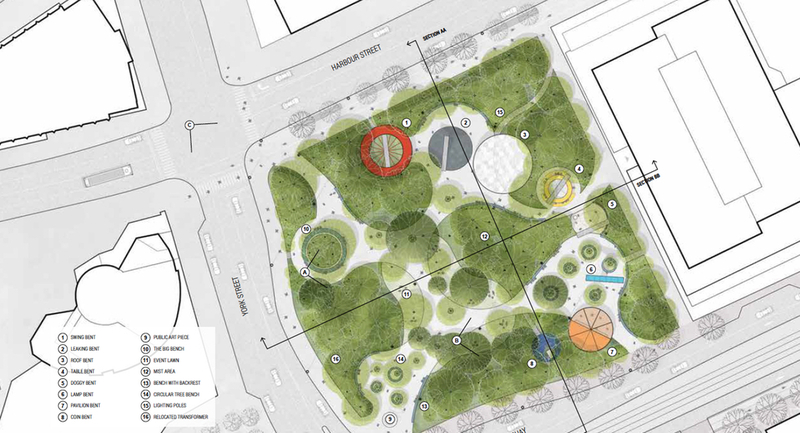 Key features: Gardiner Green envisions itself as a park for everyday use, but that doesn’t mean it’s lacking in playfulness. 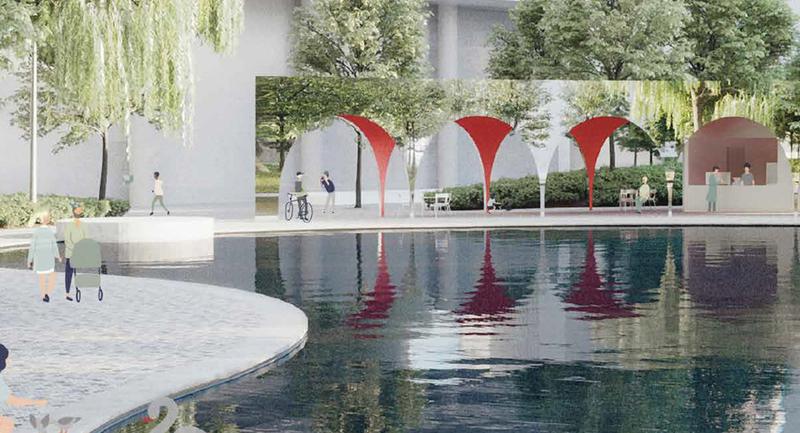 Made to resemble a forest, the park will contain a number of rooms punctuated by the Gardiner’s eight original concrete bents – only now, they’re repurposed as giant lamps, pedestals that drip into pools, swings and giant tables. Talk about visual intrigue. Built on a rolling topography, Gardiner Green is dense – it’s meant to envelop people by layering upper and lower canopies of trees. With the site mimicking a natural forested area, Plant and Mandaworks say it is prepared for storm events, with rainfall being diverted by plantings into storm-water collection centres. Key features: BYOT, quite naturally, stands for Bring Your Own Toronto. And instead of drawing inspiration from lakeside parks, it takes cues from the city’s most beloved neighbourhood green spaces, such as Trinity Bellwoods, Monarch Park and Sorauren Park. 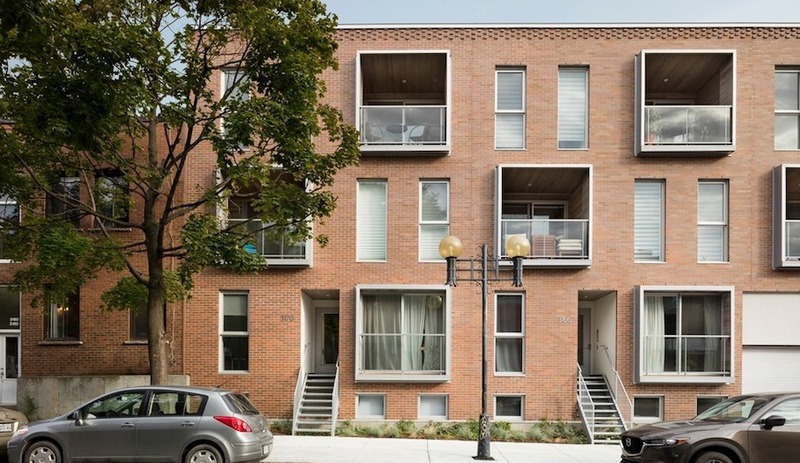 In the designers’ terms, it wasn’t built to be a cottage-like experience – it was built to be a reason to stay in the city. A deciduous “green heart” sits at the centre of BYOT. 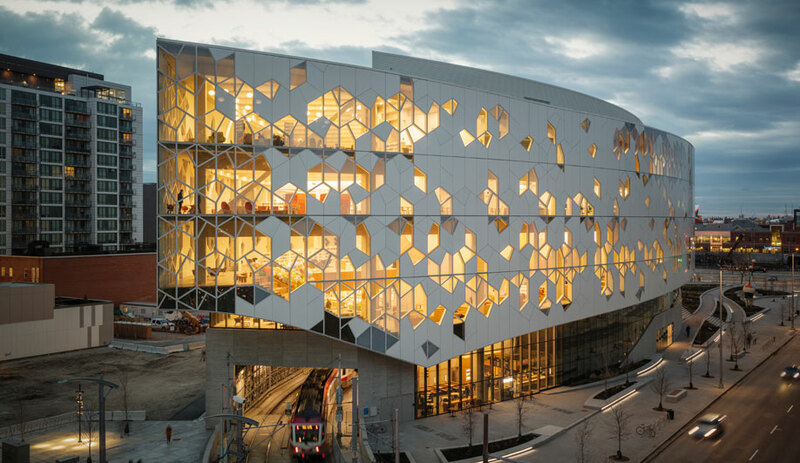 It’s orbited by a 100-metre-long arching trellis (above) supported by concrete bents, which provide shade, lighting, support for vines and interactive features. Two small pavilions, also incorporated into the bents, provide administrative services; and lawns, sheer enclosures, a wading pool for dogs and sycamore groves orbit BYOT’s central forest. Like other neighbourhood parks, BYOT aims to provide shelter, flexible space, cooking areas and places for children to play – but time will tell if it becomes Bellwoods by the Lake. 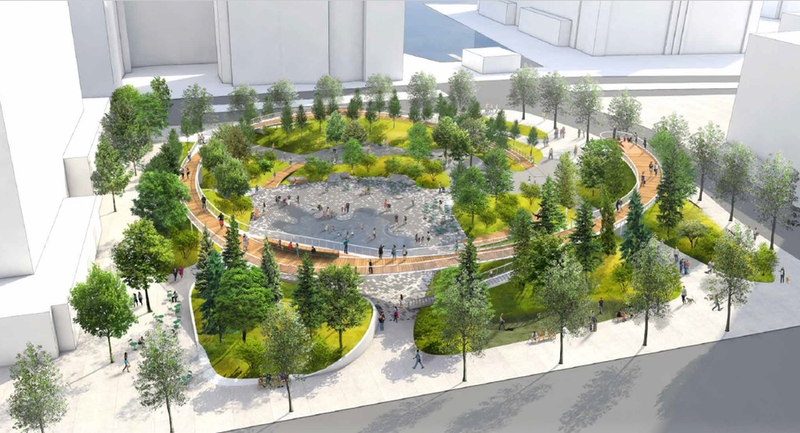 Key features: Love Park describes itself as a “green space with a pinch of whimsy,” which comes as no surprise – Claude Cormier is the firm behind Toronto’s dog- and cat-themed parks. Love Park, described as an “alter-ego” to its glassy surroundings, zigzags trees and promenades around a 40-by-50-metre heart-shaped reflecting pool. Follies will be incorporated, which gives Love Park a distinct foreground, middle ground and background, making it seem much larger than it is. 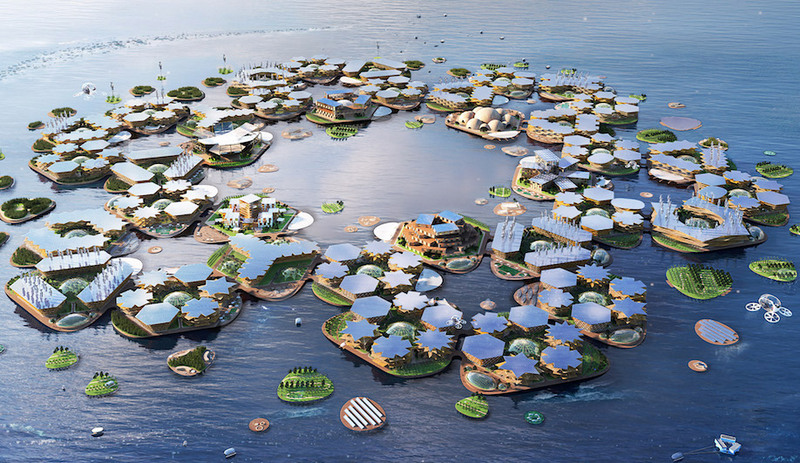 Cormier also plans a number of surprising features, including an island embedded in the floating pool, an Instagram-worthy suspended illuminated heart, platforms that resemble layered wedding cakes and a mirrored arcade that conceals a functional pavilion. Whimsical indeed. Key features: Parks should get better with time, Stephen Stimson and MJMA suggest, and York Forest plans to cover 90 per cent of its site with a heritage-tree canopy in 10 years. 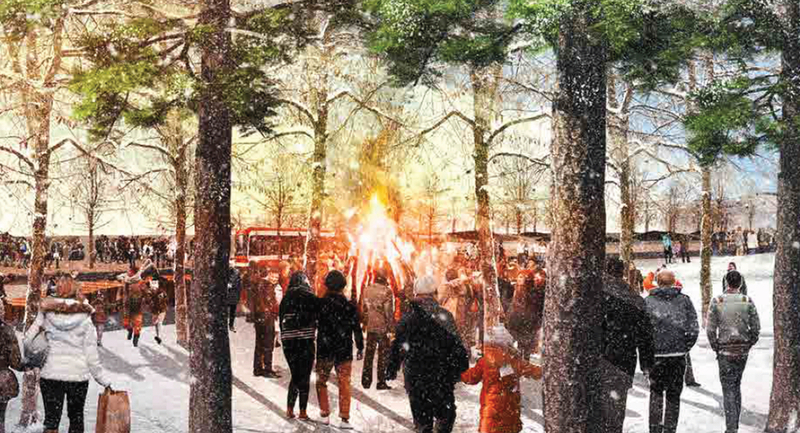 This would result in a microclimate that “shades in the summer and shields in the winter,” creating an all-season space for social, cultural and otherwise unexpected gatherings. Ringed by stormwater features – meant to evoke the lake, even if the park doesn’t border it – York Forest is anchored by a “quiet centre” and a water garden, home to the aforementioned deciduous trees. Amenities orbit the forest, which include entry groves at opposing corners, multiple separate seating areas, an event space, bike shares and an area for food trucks. There’s plenty of room for events, but its green centre aims to provide day-to-day tranquility to office workers and residents.